Registration deadline for Nov. 6 election is Oct. 9. On Sept. 25, National Voter Registration Day, Saffron Kaplan in a bright yellow banana suit ran from one side of this campus to the other to speak to students about voter registration. “We are trying to get that last push and get as many voters registered as possible,” Kaplan said. The intern is the campus lead for this college with Mobilize Organize Vote and Engage, known as MOVE. The organization started in 2013 as a small student-run organization at the University of Texas San Antonio. It has expanded to become a statewide operation. “So a lot of people have this mindset, especially with presidential elections, that their votes don’t matter,” Kaplan said. “Last year, we registered about 1,508 people (on Voter Registration Day),” Move fellow Noelani Sanchez said. 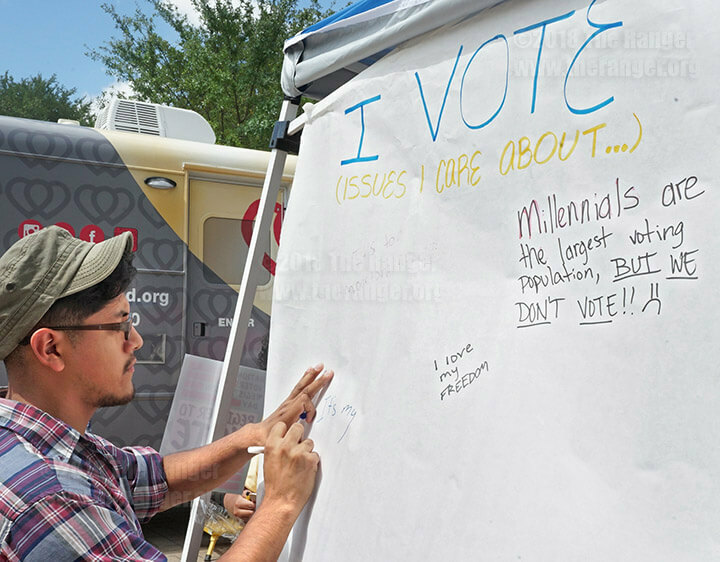 The MOVE Texas goal was 350 voters registered at this campus and 15,000 statewide. In a single day, MOVE Texas registered 165 people here and 5,375 people on college campuses statewide. MOVE Texas is close to registering about 30,000 students statewide this year. Students were enthusiastic to participate in the political process and the upcoming midterm elections. “For students to be able to voice their concerns, voting is the best way to do that,” business sophomore Karen Ortiz said. Deadline for registration is Oct. 9. Election Day is Nov. 6, and early voting is Oct. 22. For more information, visit movesanantonio.org.